Things you need to know about the 2017 Hyundai Sonata midsize sedan. The last major update for the Hyundai Sonata came just two model years ago, so we won’t be seeing another full redesign for quite some time. That said, Hyundai have made the 2017 model a little more appealing by delivering new features and a drop in price. The South Korean automaker really wants to bolster their line-up in the US, which is why the 2017 Hyundai Sonata now comes with new technologies, a trio of powertrain options, and available dynamic bending lights. The lights in question turn the beams when the vehicle is cornering so that the driver can see more of the road. This addition will be made available on the top of the range (Sonata Limited), but the new pricing is for all Sonata trim levels. Like the 2016 model, this year’s version comes with a trio of 4-cylinder engines, which are a 2.4-liter with 15-hp, a 2.0-liter turbo that cranks out 245-hp, and a 1.6-liter turbo that delivers 178-hp. The latter of the three can only be found on the Sonata Eco at this time. The other two engines are mated to a 6-speed automatic transmission, while the engine in the Eco comes with a 7-speed DCT. 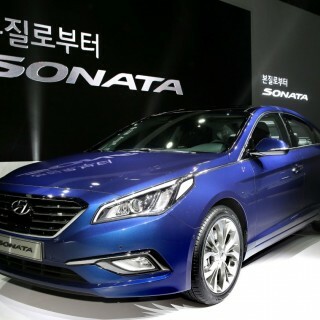 Pricing for the base Sonata model jumps by $300 to $22,435, while the SE is up a mere $200 to $22,785. The Eco model starts at just $23,960, which is a $600 price drop over the previous model year. The biggest savings can be found with the Sport trim level featuring the 2.0-liter turbo engine, as it drops $2,325 to $27,435 (the Sport with the base 2.4-liter engine remains the same at $24,325). Hyundai were able to bring in that proce adjustment by losing previous standard features, such as HID headlights, LED taillights, a proximity key, dual-zone climate control, and a blind-spot monitor. The Sonata Limited starts at $27,986, which is $200 less than the previous model year. If you go with the Limited 2.0T, which starts at $34,910, you get all the standard features, as well as everything included with the Technology package. That pricing is the same as the 2016 model year. The only change being made here sees the Venetian Red Pearl exterior color removed in favor of the brighter Scarlet Red. Hyundai has yet to reveal the official release date of the Sonata, but they did say that the first batch is ready and on their way to showrooms across the country. This generally means that they will start to show up for sale in the next week or two. The 2017 Hyundai Sonata is a great value proposition for car buyers. It’s now about to get even better, thanks in lathe part to streamlined packages and improved price points.